Most Ayurvedic texts discuss the anti-inflammatory properties of this illustrious member of the frankincense family. It has become a popular herb for joint pain, but research in Germany suggests that it also reduces edema associated with brain cancer. It is also an excellent parasiticide, and preliminary in vitro tests indicate that it has antifungal properties. Contains: steam distilled certified organic Boswellia serrata oleogum resin. 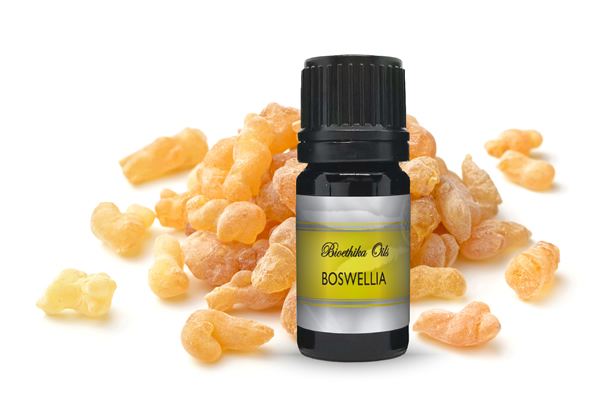 Boswellia serrata is a type of frankincense, but not the same species used in most Western incenses and rituals. However, it is also highly regarded as a spiritual plant and is often grown in temples in India. Contains: Certified Organic Boswellia serrata resin. Contains: Organically grown Shallaki resin in certified Organic Grain Alcohol. Contains: 500 mg. sustainably wildcrafted Boswellia serrata resin: 85% (425 mg.) boswellic acids, 5% AKBA, plus cellulose, silicon dioxide, stearic acid, crosscarmelose sodium, magnesium stearate, vegetable glaze. No animal ingredients. Non-irradiated. No solvents, no BPA, organic cotton stuffing. Vegetable capsules are made from carbohydrate gum derived from naturally occurring vegetable cellulose, or plant fiber (in particular, pine plant cellulose). 100% free from animal by-products and preservatives, these certified kosher vegetable capsules do not interfere with digestion and absorption of the ingredients within. The average fill weight is 650 mg. Contains: Vegi-caps are made of 100% vegetable cellulose USP. They do not contain any animal products or preservatives. 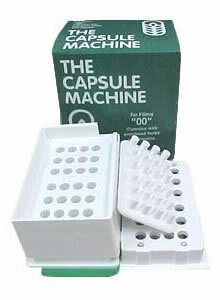 This device is not exactly a "machine" but rather a handy way to fill capsules. One tray holds the larger end of the capsule in an upright position so that the top is level with the surface where the powder is put. The powder is then moved back and forth until the capsules are full. A tamping device for packing down the powder is included. 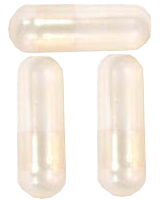 Once full, the capsules are raised so that the caps can be put on. With a little experience, this process goes quickly, allowing hundreds of capsules to be filled in a surprisingly short time. Contains: Contains tray for 24 capsules with pusher for filling empty capsules.